SATURDAY ONLY: See more than 700 vintage and exotic cars for FREE! Check out tons of cool cars at this free event in Fountain Hills! 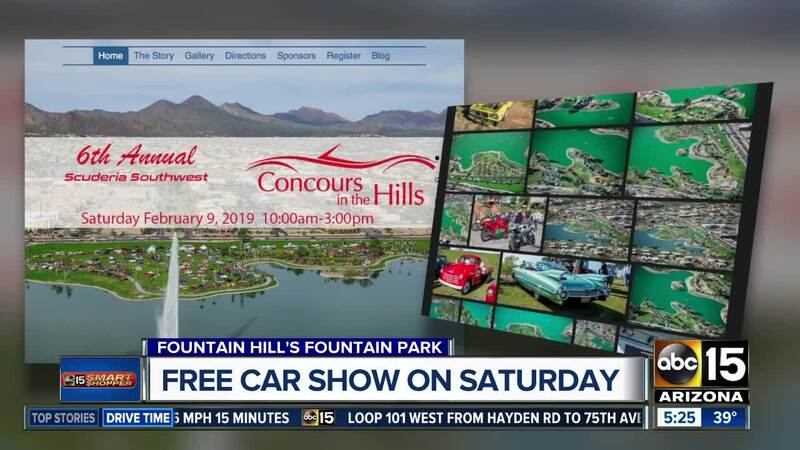 FOUNTAIN HILLS, AZ — If the thought of seeing classic and exotic cars revs your engine, then you'll especially love this edition of Freebie Friday! More than 700 cars will roar and rip into Fountain Hills' Fountain Park Saturday, February 9, for what's called Scuderia Southwest's Concours in the Hills . The best part is, this event is FREE! You'll see cars on display valued up to $20 million! We're talking Ferraris, Lamborghinis, Aston Martins and more! One hundred percent of the registration and sponsor fees benefits Phoenix Children's Hospital . We were told that the creator of the event is actually a childhood cancer survivor, and that's why he chose PCH to be the beneficiary. Saturday, February 9, from 10 a.m. to 3 p.m.